Tutorial 2. Choosing Sewing Techniques for Large-Size Corset Garments. Tutorial 3. Calculating Pattern Alterations. Part 1. Tutorial 4. Calculating Pattern Alterations. Part 2. Tutorial 5. Constructing the Corner for Attaching Shoulder Straps. Tutorial 6. Applying Alterations to the Pattern. Part 1. Tutorial 7. Applying Alterations to the Pattern. Part 2. Tutorial 8. Applying Alterations to the Pattern. Part 3. Tutorial 9. Preparing for the Cutting Process. Tutorial 10. Cutting the Lining of the Dress. Tutorial 11. Duplicating the Lining. Tutorial 12. Marking the Bones. Tutorial 13. Sewing Down the Princess Seams of the Lining. Tutorial 14. Sewing Bones onto the Front Half of the Dress. Tutorial 15. Sewing Bones onto the Front of the Dress (Continued). Tutorial 16. Overlaying the Bones. Tutorial 17. Padding the Cups with Polyester Wadding. Tutorial 18. Duplicating the Cups. Preparing the Pieces for Draping. Tutorial 19. Draping the Back of the Dress. Tutorial 20. Draping the Front of the Dress. Part 1. Tutorial 21. Draping the Front of the Dress. Part 2. Tutorial 22. Securing the Drapes on the Dress. Tutorial 23. Sewing Down the Central Seam and the Side Seams of the Lining. Tutorial 24. Cutting the Skirts. Preparing to Insert the Zipper. Tutorial 25. Installing the Zippers into the Dress. Tutorial 26. Attaching the Skirts to the Dress. Tutorial 27. Draping the Waistband. Securing the Drapes. Tutorial 28. Finishing the Lacing Area. Tutorial 29. Sewing the Shoulder Strap and a Modesty Flap. Tutorial 30. Embellishing the Dress with Lace Applique. Tutorial 31. Embellishing the Dress with Rhinestones. Tutorial 2. Choosing Sewing Techniques for Large-Size Corset Garments. Review of Materials Used for This Particular Dress. I am glad to take you further into this course dedicated to sewing a dress for a woman with ample curves. It is a series of tutorials on sewing corset-based garments with BC 100cm and above. That is, US size 14+. I would like to say a few words about the tasks we need to solve and the challenges we will be faced with. You are right to some degree. Not entirely though. There are certain peculiarities that arise when you're working with sizes 14 and up. They concern sewing bones onto the cups, as well as the entire pattern construction process. What am I trying to say? Let us take, for example, the dress we are about to sew. You have seen pictures of the finished garment and you could see the way it sits on the model. Your first thought was probably, “It's clear. Either she sewed in the cups or she made a separately cut corset and then attached a full flared skirt to it.” And that's where you are wrong. Sizes 14 and up bring about some challenges. The lining of the dress has to be whole. And you must by no means sew as many bones onto the cups of a size-14 dress for the sake of making them rounder. I am not trying to say you must never adjust the shape of the cups with the help of bones. There may be exceptions to the rule or your client may have her own preferences. Always think over what the client wants and what you need to achieve before choosing a particular sewing technique. I know it from my own experience that some women with full breasts avoid the push-up effect because it makes the bust appear even larger. And there is absolutely no need in that in their case – it looks really vulgar. You don't need to enhance the shape of large breasts artificially by forming dome cups. A well-shaped pattern is enough! Full breasts will naturally fill the space inside the cups. No special tricks are required to give the bust a beautiful shape. Small breasts lack the volume necessary for the classic corset shape, so you have to trick Mother Nature and make up for it. Full-breasted women, on the contrary, want to visually make the bust smaller. Let us speak about the technique. Sewing bones onto the cups: always remember that cups lined with bones involve a semi-arched bone right beneath the breasts, similar to bra underwire (see below). It is sewn on before all other bones. What is the function of such cups? They are supposed to center the breasts, lift them up to the degree determined by the bottom bone, and accentuate cleavage in an attractive way. All of this comes naturally with full-figured ladies: their breasts don't need to be either raised or centered, or even pushed up. It's a gift from nature. Moreover, a bone placed at the bottom of the cup will cause the arched area to get eased in. This will make the cup even more dome-shaped and the bone will cling tight to the body. In other words, there will be no space between the garment and the body. The bone will perform the role of a bra underwire. It works the same way with sew-in cups. Their construction ensures good fitting to the body and makes the bust look more appealing. This is obviously superfluous if your client has full breasts anyway. If you look at a pattern of a corset sewn in the simplified technique, you will notice that its front is made of three pieces. 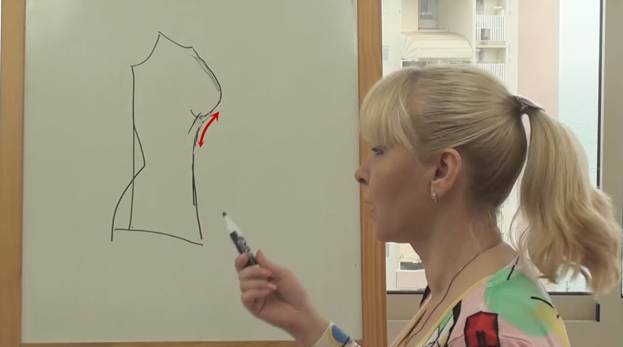 Everyone who has tried the simplified sewing technique knows that there is always some space between the body and the garment in the area where the chest merges with the ribs (side view). It's a noticeable disadvantage for small-breasted women. The breasts might slip into this hollow, which will destroy the entire push-up effect that normally works so great with small breasts. The same thing, however, works great for large-breasted women. That “sink-in” effect makes the push-up effect more neutral. The advantages of using a pattern like this for large-size garments are obvious! If your client or the dress itself demands that you make a corset with sew-in cups, just try to imitate them with the help of decorative elements. I will never get tired of saying that you should never use the see-through corset technique for full-figured clients. You can still use the same technique with opaque fabrics though. It's just that the bones will be vertical, just like on the corset for a young woman from my previous courses. The cups will feature an inner bone sewn onto the lining. There is always a way out, you can surely invent something to fulfill your client's request by decorative means of some sort. This was just a small foreword and now I'd like to explain the construction of our dress. 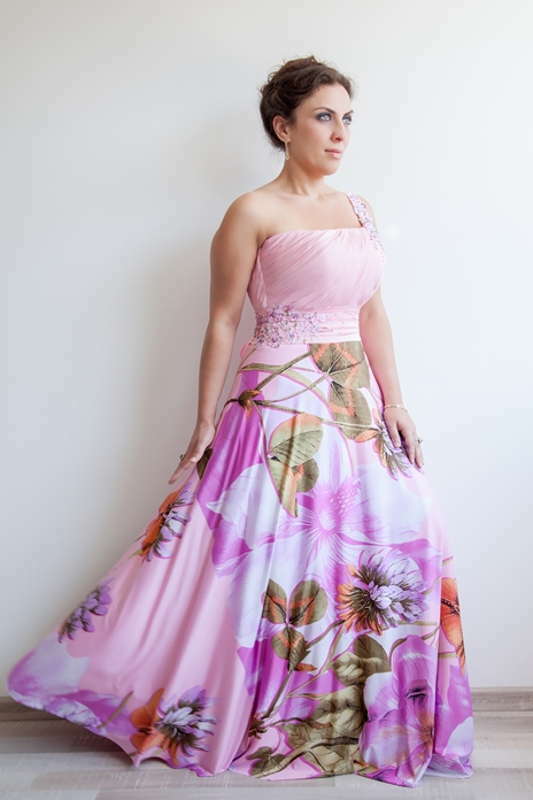 It is advisable to sew one-piece corset dresses for full-figured women to re-shape the body and improve the silhouette in the stomach and in the hips. It will have a better fit and a better body control effect regardless of the overall dress model. We will use decorative elements to imitate sew-in cups and separate top and bottom "joined" along the waistline. In reality there will be an inner corset construction that will re-shape and restrict the body and ensure a slim yet comfortable fit. It will improve the wearer's posture and encourage her to throw her shoulders back and walk gracefully. So this will be the lining of our dress. There will be one layer of lining duplicated down to the hips and with bones placed in correspondence with the nuances peculiar to working with large-size garments. There will be fan-like drapes at the front and horizontal drapes in the waistline area. After arranging the drapes we will attach a semi-circle underskirt at the waist or above it. Next, we will overlay it with a bright, large-print semi-circle skirt. To top it up, we will overlay the area where the skirts join the top with a draped waistband. The drapes will be arranged in an absolutely random order on the waistband unlike the organized fan-like drapes in the upper part of the dress. Trust me, it’s a lot more difficult to achieve such “creative chaos” than organized folds but I will teach you how to do it. Next we will attach the shoulder strap. It will slightly pull up the top edge of the corset to prevent it from sagging down under the weight of heavy breasts and ensure proper fitting. Generally, shoulder straps in corset garments are purely decorative elements. They don't perform any supporting function. The waist is the main part responsible for the entire construction of the dress. The dress will never shift around or fall down with a good fit in the waist. Still, the shoulder strap can be a real helper for women with BC 100cm and above. It supports the dress in the bust, holds it in place, and definitely makes the garment more comfortable to wear. We will embellish the dress with appliqué motifs and rhinestones at the end. Now what concerns the back of the dress: first I wanted to add a corner at the back that would cover up the area of the arm where the shoulder strap starts. I will explain how to construct this corner and incorporate it into the standard pattern during our pattern calculations. I gave up that idea though, as soon as I began sewing the dress, because the shoulder strap is somewhat triangular and wide enough itself. In other words, it can perform the function of that corner. It's easier and faster that way. As you know, I always try to make your life easier by offering simple ways of solving various tasks. That's why the back of the dress will be plain. There will be a lace-up area that'll stop at the waistband and then there will be a zipper sewn into the central seam. We'll install an additional zipper into the lining. I will share a clever way of doing it to preserve the shape of the hip. So there will be two zippers: one in the lining and another in the outer skirt. The shoulder strap will be embellished with lace and rhinestones. When you start working on a large-size garment, when you start thinking logically trying to make things clear, it turns out this kind of work is not any more difficult than working on any regular corset. Let me repeat the major three points you need to keep in mind. Firstly, try your best to avoid sew-in cups with many bones in them. Use whatever decorative means you can think of to imitate a see-through corset with sew-in cups but make sure to use either the simplified corset pattern or the pattern of the corset for a young woman. Secondly, you can use a corset pattern with four princess seams at the front and cups lined with bones but don't try to give the cups a dome-shape with the help of bones. Stick to the technique that I will demonstrate to place bones correctly. Thirdly, do not place a horizontal bone under the bust regardless of the general technique you have chosen. Avoid making the garment too tight in the chest. And last but not least, the lining must always have a slim fit to 'put your body together.' This is relevant for any dress model, regardless of whether it features a flared skirt, a Greek silhouette, or lightweight flowing skirts. This way all that free-flowing cascading fabric will create a soft slimming silhouette. And even if you add a chiffon skirt, it will be the enhanced silhouette that will show through when your client stands in the light. Now let me show you the fabric I have chosen for this dress. Here is the fabric that I will use for the inner base of the dress. It will be used for the lining, the semi-circle underskirt and the drapery in the upper part of the dress. This fabric slightly stretches crosswise and doesn't stretch lengthwise at all. It is lightweight, matte, and at the same time resilient and dense. You could use different types of fabric: silk, stretch satin, synthetic fabrics, as long as they are not heavy. I have chosen knitted fabric for the skirt. It stretches both crosswise and lengthwise. This fabric has a kind of a kerchief pattern printed on it. There's a clear border between the patterns. It will get disguised by the falls of our semi-circle skirt. I really like the large floral print of this fabric that I will use for the skirt. We don't need anything else apart from appliqué elements. I will choose matching lace motifs and rhinestones. I will use rhinestones of varied colors: pink, purple, warm green, and orange. They will match the colors of the bright floral skirt.